Suitable for active users. Enhanced stability with extended wheel angle. Center of gravity of rear-wheel can be adjusted for optimal control and maneuverability. 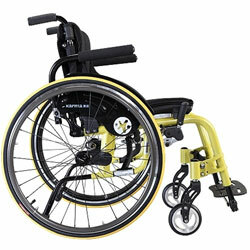 Equipped with 5" aluminum front caster for improved performance and efficient propelling. The Ergo Live is designed for those who want to ride boldly. The unique tubes, welding, and components are precisely optimized to achieve the highest strength to weight ratio. The Ergo Live transfers your energy to the street with ultimate style, comfort, and expression. The revolutionary S-Ergo system is the world's first s-shaped ergonomic seating designed according to the body curve, which is capable of simultaneously relieving pressure, stabilizing seating position and reducing downward sliding. 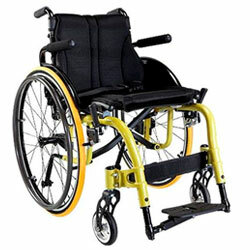 Adjustable rear axle position, backrest height & angle, seat height and multiple choices of seat dimensions are available to fit personal requirements. The lively rear-wheel features lightweight and improved propelling performance. The 5" aluminum rim caster further enhances Ergo Live performance. Elegant streamlined design enhances and complements personal style. 13" - 16" & 16" - 19"
Lightweight and improved propelling performance.